Binfer 3.3 release brings you a redesigned Web Pickup page, two additional download methods, thumbnail view, website integration and HTML5 media streaming. For those reading about Binfer for the first time, here’s a short introduction. Binfer allows you to instantly share large files with family, colleagues, clients or customers, directly from your computer. Unlike other solutions, you don’t have to worry about exposing your file system, setting up permissions etc. There is no complicated server to setup. Your files are not uploaded anywhere. With Binfer, you can transfer files of any size and quantity over the Internet, easily, securely and directly. With Binfer, you share exactly what you want and with whom you want. All files stay on your computer. You have full control over the data. Along with file sharing, it also has secure email and chat applications. While most of its benefits are realized with the desktop application, you can also integrate it on your own website to receive and deliver files with web widgets. This blog is about what’s new in this release. Please do visit the other pages on this website for more details. While, everyone can find great benefits, some features are more applicable to specific kind of user and their use cases are highlighted in the Application section. Files can also be downloaded using the Advanced Binfer Receive Applet. 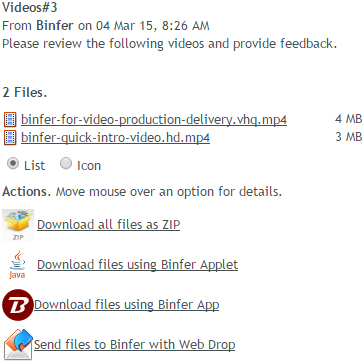 The Binfer Receive Applet can download all files automatically and resume interrupted transfers. Recipients do not have to create an account to use this option. Files can be viewed in Icon view. 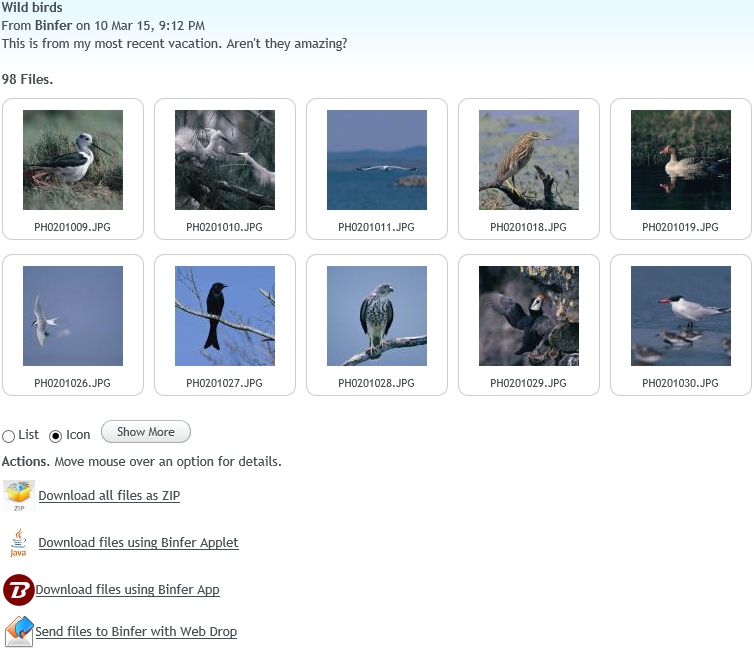 Icon view will automatically generate thumbnails of photos sent in the message. Share Family Photos You no longer have to compromise your privacy by uploading your family photos online. Binfer will automatically generate thumbnails of shared photos. 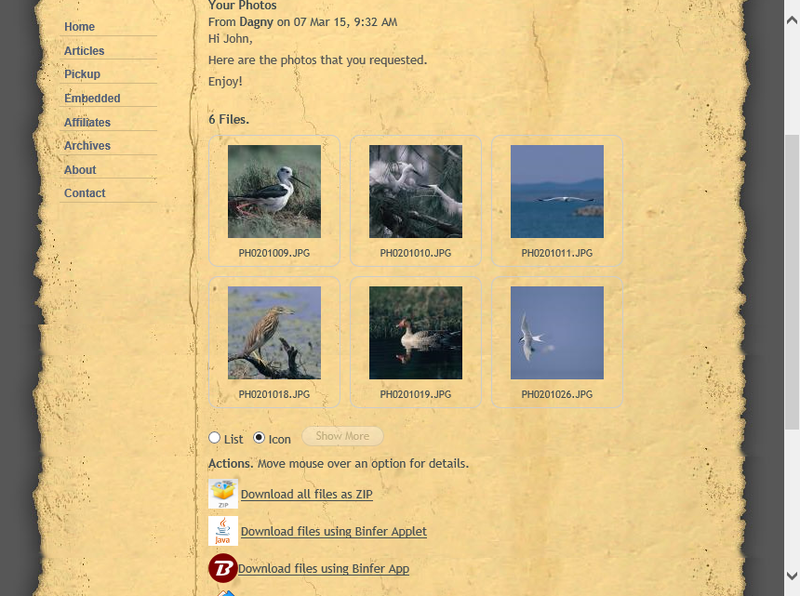 Family members can quickly preview the photos and download the ones they like. When done, simply delete the shared message and no one can access them anymore. Now, you can deliver files from your own website. The Web Pickup widget can be easily added to any page of your website in minutes. Photographers Share photos instantly from your own site and computer instead of uploading them somewhere. By the time it will take you to upload one picture, you can share 100 pictures. Digital Content Seller If you are selling any kind of digital content then you can deliver them directly from your own website instead of sending users to get the files from dropbox, hightail or some other external service. Files delivered from your website are not public. They have the same security features as the standard Web Pickup app. Many companies are blocking cloud based file sharing services. You will have a better chance of delivering files to clients from your own website. 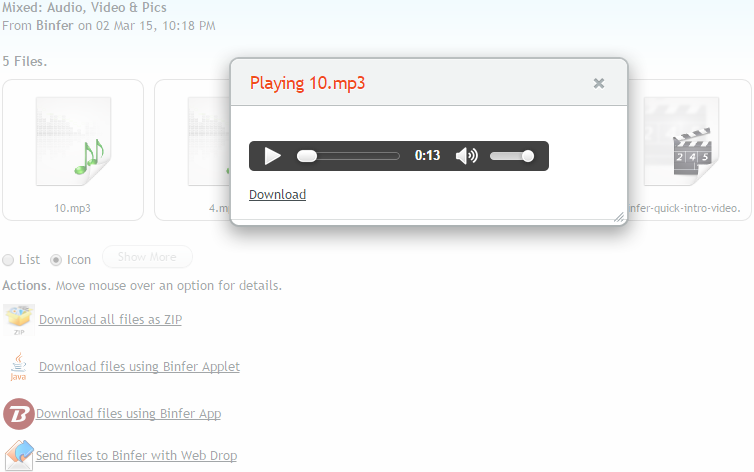 Recipients can also play video files without downloading them, if they are HTML5 compatible, such as MP4 or WEBM. Videographers You can instantly stream videos directly from your computer, instead of wasting hours uploading them on external servers. Clients can watch videos instantly, provide feedback sooner and you can finish projects faster. If you share music files that are HTML5 compatible, such as MP3, then the recipient can play the music files without having to download them. Music Producers Tired of uploading your music on third party sites? There is no better way to instantly share and distribute your music to fans. Create a group for your fans and simply drag and drop the music files. And they can listen right away.